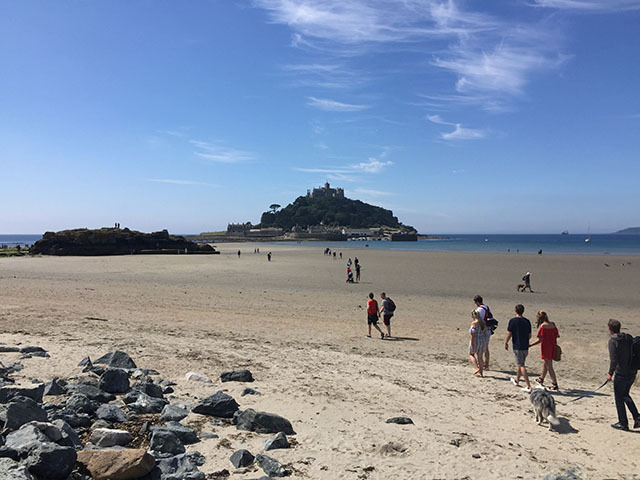 One of Cornwall’s most iconic landmarks, the castle-topped tidal island of St Michael’s Mount, sits in Mount’s Bay, opposite Marazion and close to Penzance. 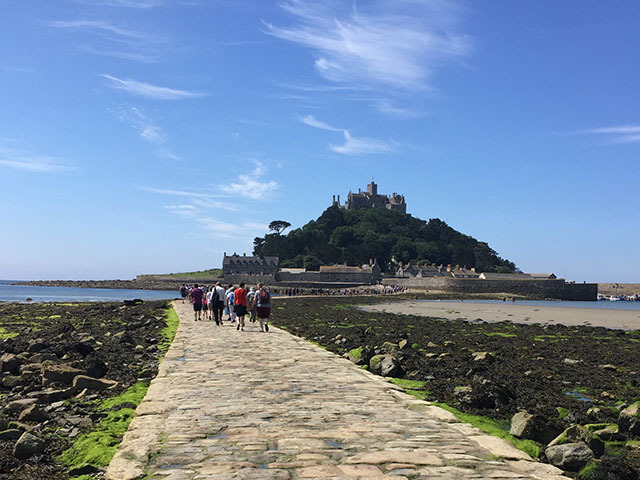 If you live in Cornwall, or are holidaying here, a trip across the causeway to the magical Mount makes an unforgettable day out. My friend and I took our children there on a beautiful, sunny day in early July. In my opinion, it’s best to begin your day by walking across the cobbled causeway, but you have to be lucky with the tides. The causeway opening times are listed here. There’s something rather exciting about arriving by foot, and then watching the tide come in to cut you off from the mainland. 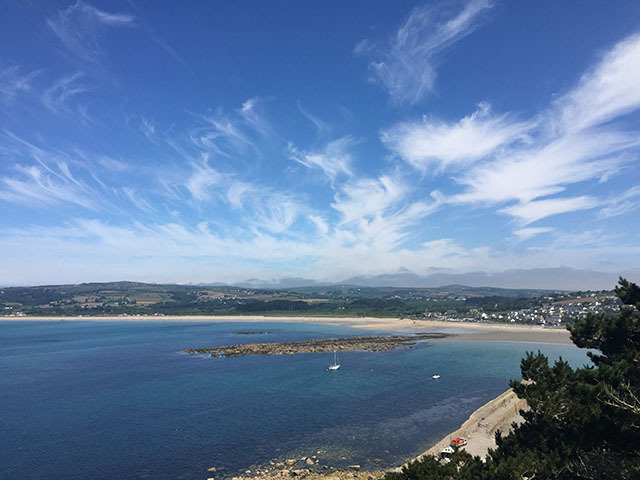 Once there, a scramble up the (fairly steep) path to the top of the Mount is rewarded by spectacular views across Mount’s Bay, before exploring the ancient castle. The children’s treasure hunt was a hit with our girls, making them search for interesting objects amongst the historical displays. And there is a staggeringly huge amount of history here, with the existing buildings dating back to the 12th century. We were fascinated by tales of mermaids and giants, miracles and pilgrims, and battles for the capture of the Mount over the centuries. After exploring the castle we enjoyed our packed lunch on one of the designated picnic lawns. 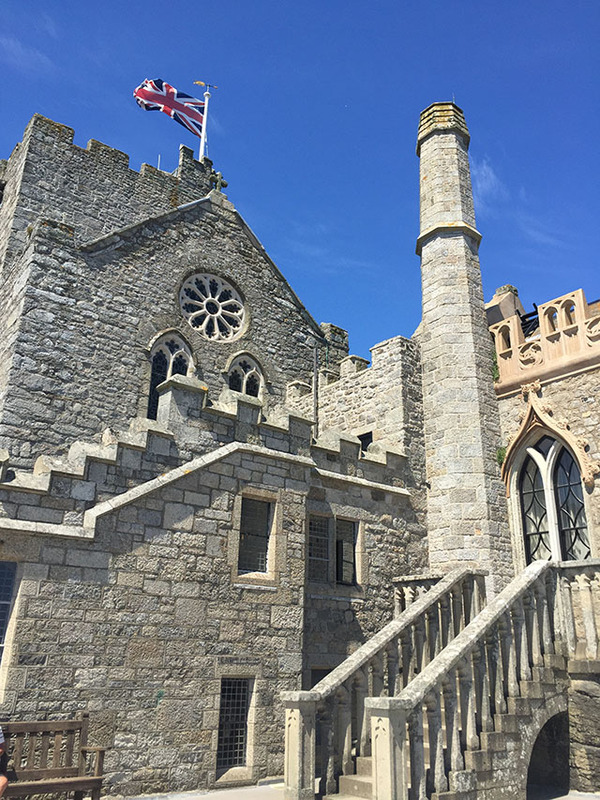 There are two cafés on the Mount (The Sail Loft and The Island Café) as well as a kiosk selling ice cream, drinks and pasties. 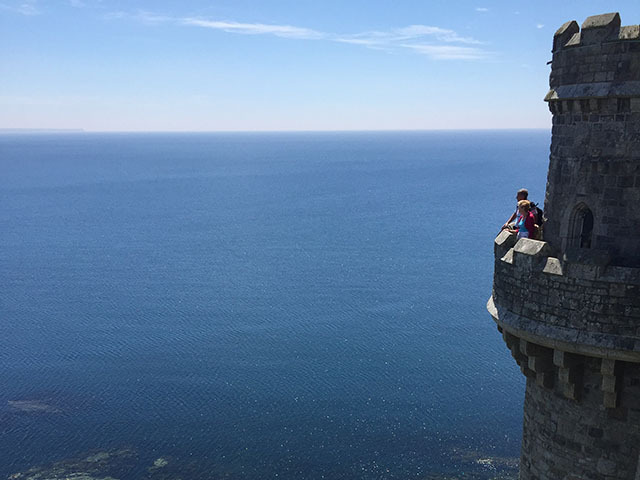 There’s a lot to see and do here, with towers to climb, paths to follow, and scenery to admire. 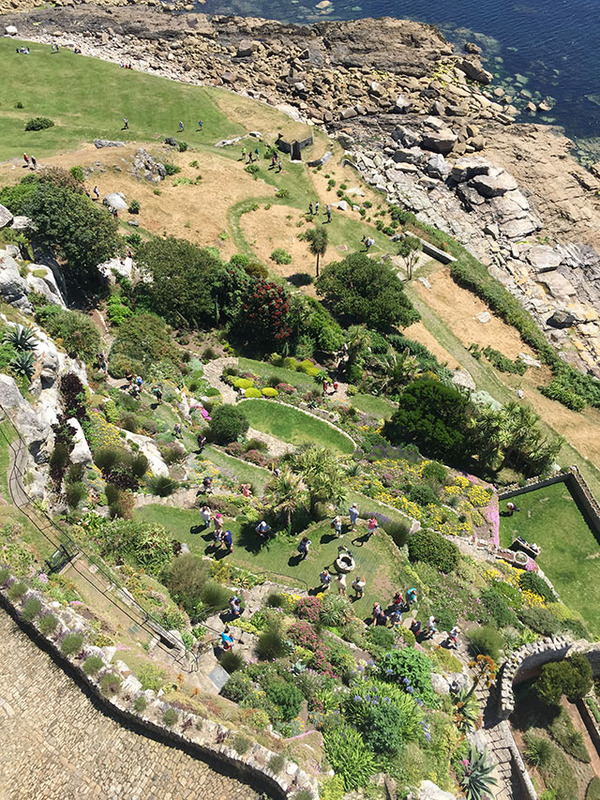 The view of the gardens from above was particularly impressive. 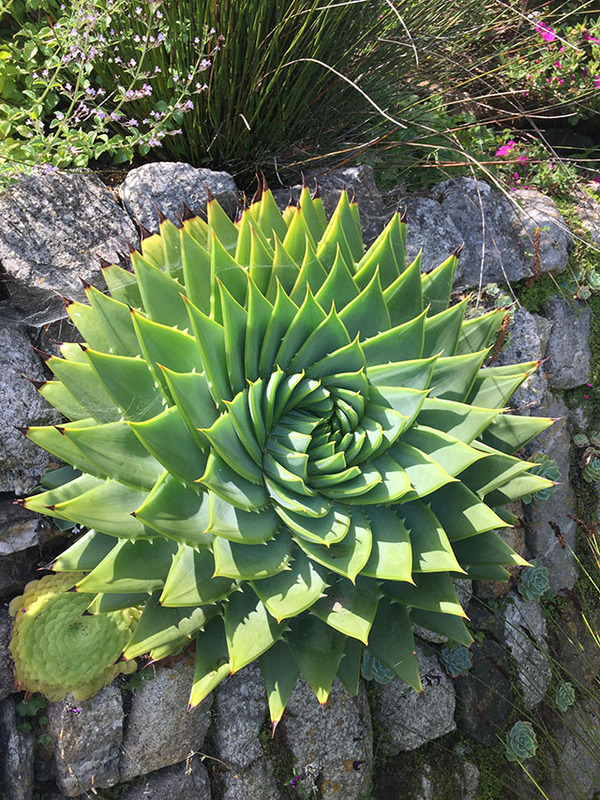 Huge succulents (the biggest we’ve seen) and an abundance of flowers grace the gardens which, sheltered from the prevailing wind, have a tropical air to them, and are way ahead of our north Cornwall garden. The walled gardens and steep terraces are criss-crossed by a tangle of paths and steps, and we had great fun exploring them. I could write pages about the gardens alone; instead, please visit stmichaelsmount.co.uk/explore-the-mount/garden for more information. 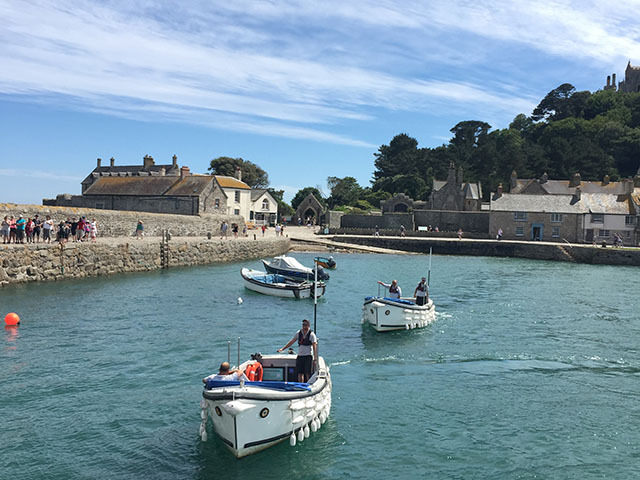 After our day on the Mount the tide was high and the only way back was via boat; there’s a small fleet of motorboats which whizz back and forth between the Mount’s ancient harbour and Marazion. Expect to queue for a little while if it’s a busy day. 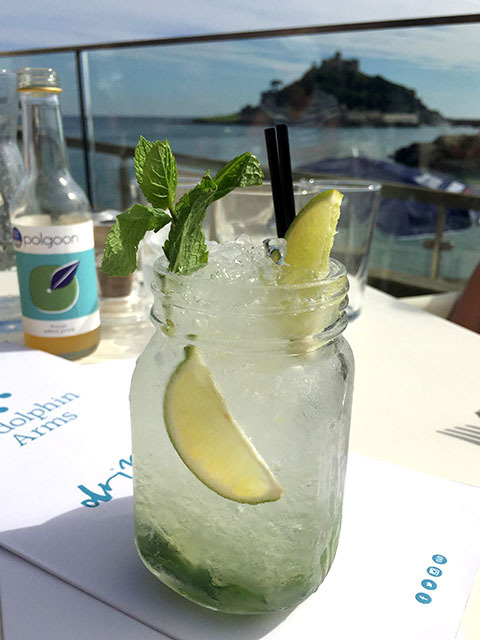 The Godolphin Arms sits above the beach in Marazion, near the causeway entrance, and has the most fantastic views across to the Mount. It seemed like the ideal place to put our feet up after a long, hot day. With drinks in hand (I had a refreshing “mockjito”) we watched the world go by – kayakers, SUPers and swimmers all enjoying the crystal clear water. 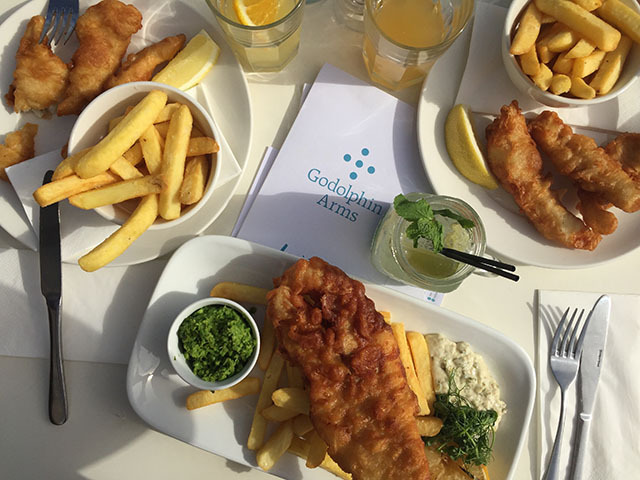 We tucked into hearty portions of fish and chips – goujons for the children and a generous piece of super fresh fish with perfectly crisp batter for me. The homemade tartare sauce and minted peas were delicious too. All in all, this was a hugely enjoyable and successful day out. 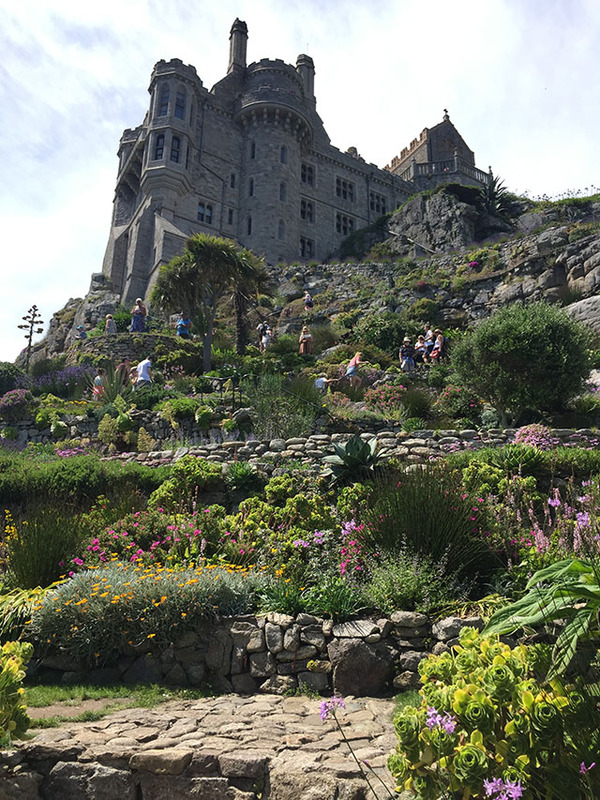 If you’re planning to visit the Mount then allow plenty of time to see the castle and gardens, and make sure you check the website for opening times before you set off. 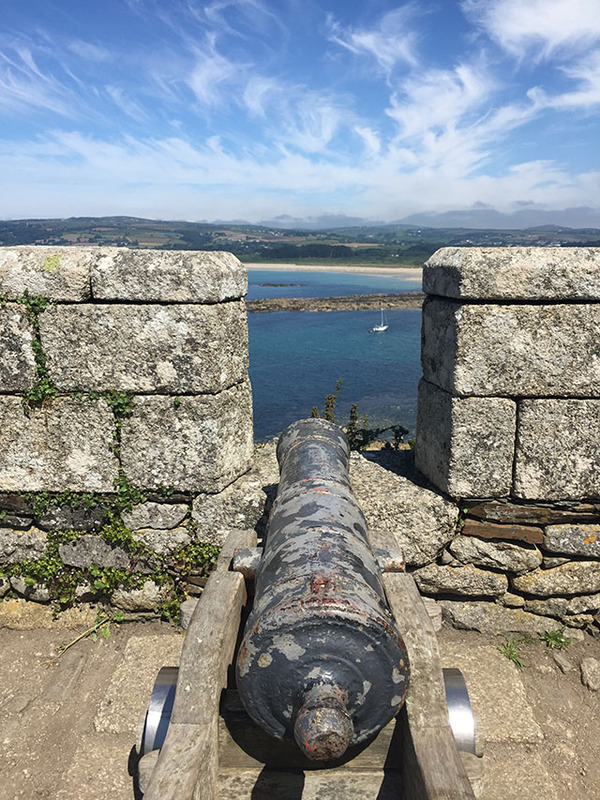 The National Trust cares for St Michael’s Mount and entry is free for National Trust members. 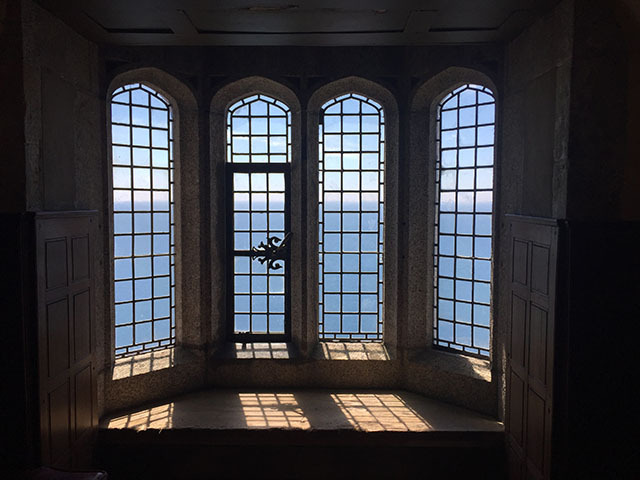 For a full list of entry prices and opening times visit stmichaelsmount.co.uk. N.B. The castle, shops and cafés are closed on Saturdays, and the garden is not open every day. The causeway is open either side of low tide; for causeway opening times see website. The ferry costs £2 for adults and £1 for children. For more information about St Michael’s Mount see www.stmichaelsmount.co.uk. We ate at The Godolphin Arms in Marazion. For full details of their restaurant, menus and hotel rooms (with amazing views) visit their website. Thank you to St Aubyn Estates for looking after us and for making our day out so much fun. 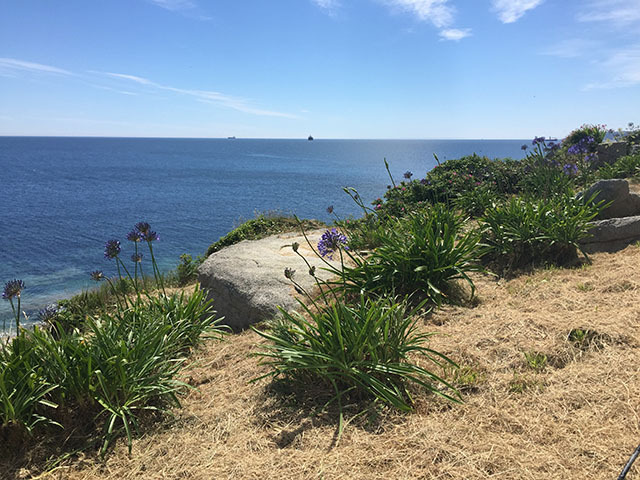 Disclaimer: St Aubyn Estates gave us free entry to the castle and gardens, and treated us to fish & chips and drinks at The Goldolphin Arms. All photos by Ellie Michell. Brilliant review. We will definitely be going in 2018.